The US Army’s use of explosive weapons in Fallujah, Iraq, had a disproportionally higher effect on Iraqi civilians than British military strategy in Basra, a new study into the effects of the coalition occupation has revealed. US forces were found to be responsible for killing 1,382 civilians during two operations; 130 percent more than British forces, who were responsible for up to 593 civilian deaths, with the British firing 34 percent fewer artillery rounds than their American counterparts. America was also responsible for using cluster bombs far more extensively than the British. 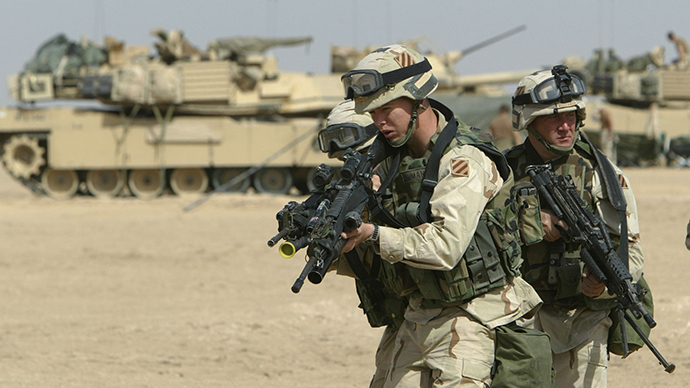 The report by Action on Armed Violence (AOAV) investigated the conduct of British troops in Basra, 2003, and American forces in Fallujah, 2004, to explore the differences in the use of explosive weapons in populated areas and the way both armies conformed to the rules of engagement. The report called the difference in use of weaponry in populated areas “marked” with American rules of engagement making it easier for commanders to authorize the use of heavy explosive weaponry. The British, it was found, had designated Basra a ‘restricted fire zone,’ where the use of heavy explosives was strictly monitored. Critics of the US Army, however, say they maximized the interpretation of their rules of engagement to allow greater use of heavy explosives, causing much greater damage to the civilian population. “By their own admission, US forces substituted manpower with firepower in Fallujah,” Overton said. The report lists one example in April 2003, where US aircraft bombed a building in an attempt to kill Lieutenant General Ali Hassan al-Majid, colloquially known as ‘Chemical Ali’, killing 17 people, none of whom were Ali. Human Rights Watch concluded that, even if such force had been authorized due to Ali’s high military value, had smaller weapons been used, civilian lives could have been spared. Speaking to RT, Overton said the heavy use of force by the US Army was more a “part of their culture of warfare” rather than poor post-invasion planning. “US military engagement in Vietnam through to Afghanistan has often been one of shock and awe: what happened in Fallujah will almost surely happen again unless there is a major cultural shift in American military thinking,” he added.